Operating a business online does have its perks. For example, employees are often allowed to dress in relaxed, casual attire, since they rarely have face-to-face interactions with clients or customers. Doing business solely online can also be cheaper than having a traditional storefront business, because it saves on design and display costs. However, online work does have a negative side, especially in regards to employee mental and physical health. 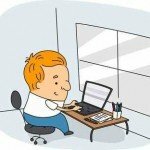 If you are the owner or manager of an online business venture, it is important to remember the following three considerations, especially if the majority of your employees use the computer to complete over 50% of their work. In 2011, the American Cancer Society came out with research results that found that women who sit for more than six hours a day were about 40% more likely to die during the course of the study than those sat fewer than three hours per day; men were about 20% more likely to die. The study was conducted over a 14-year period and involved 123,216 participants. The results of this study have been supported by additional evidence from similar studies that have looked at the negative health consequences of a sedentary lifestyle. The average online business employee remains seated throughout the entirety of their work day (an average of eight hours), so these new findings are alarming. To lessen the amount of sitting time at work, employers should encourage workers to get up and move around at least once every hour. Another great idea is to provide employees with the option to work at a desk which requires you to stand. In addition to better health, more movement at work could also help you focus by giving you a moment to “step away” from the task at hand. Do you remember your mother telling you to sit away from the TV screen or you’ll have to get glasses? Sitting in front of a computer screen all day long is one hundred times worse on your eyes. Chances are, if you sit in front of a computer all day and don’t already have glasses, you will need to get them sooner than later. Computer screens strain and weaken our vision, and this is especially true for online business employees. Workers should remember to take a break from their screen at least once every twenty minutes. You can also change the angle, brightness and text and image magnification to better suit your vision needs. If there is a glare on your screen, try using an anti-glare covering. Online business employees often work independently, even if they have co-workers. A consequence of independent computer work is that colleagues rarely find the time to speak to one another. This means that you could work with someone for years and never really get to know them. It also means that employees can work for days without having a single, meaningful person-to-person interaction. This can negatively affect the health of our minds. Even the most introverted of people need regular conversation with others to stay connected to reality. Online businesses should promote more projects that require teamwork to combat this problem. By tackling these three issues, online businesses will make the lives of their workers much more enjoyable and healthy. Even if you work as the sole employee of your business or as a work-from-home contractor, making improvements on the above considerations will make your job more rewarding. Lauren Bailey is a freelance blogger who loves writing about education, new technology, lifestyle and health. As an education writer, she researches and contributes to a guide to online colleges and welcomes comments and questions via email at moc.liamgnull@99nerualb.